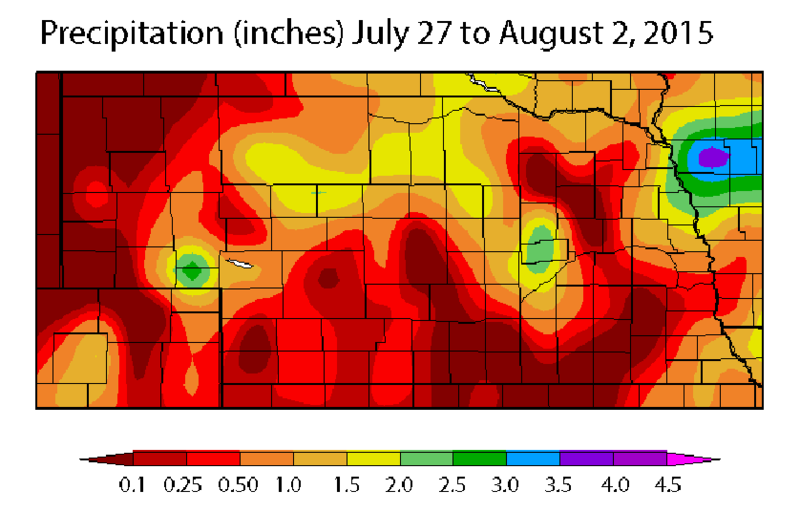 This week's soil moisture map could be called "A Tale of Two States" if Dickens were producing it. **Excludes Barta from last week. The eastern quarter of the state (i.e., east of Highway 81) is generally sufficiently moist with all sites reporting a soil moisture index (SMI) above 0.0, indicating some surplus soil water. Plus, the forecast looks favorable for 1-2 inches of rain over the next week and with temperatures expected to remain well below 90°F this week, the region should stay relatively moist. However, it should be noted that most of the sites in this region *need* to get a decent rain to keep the surplus, as only Firth and Concord have surpluses greater than an inch. West of Highway 81 conditions look much worse. As noted on last week's Drought Monitor for Nebraska, portions of south central, southwest, and the western corner of northeast Nebraska are now considered to be abnormally dry. 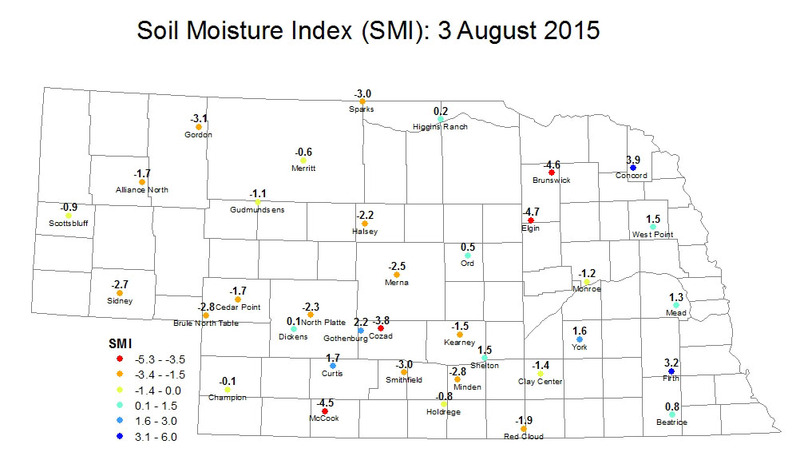 This week's soil moisture report does nothing to conflict with that assessment. Most sites in the abnormally dry region are now reporting SMI values lower than -2.0 and the number of sites with a deficit of greater than 0.75 inch has crept up to 10. The driest locations are around McCook in southwest Nebraska, around Cozad in central Nebraska, and in Antelope County (Brunswick and Elgin). There are pockets of moisture in western Nebraska (e.g., Curtis), but those locations are definitely the exception to the rule now. The good news is that the US Weather Prediction Center forecasts an inch or more of rain for much of the state. 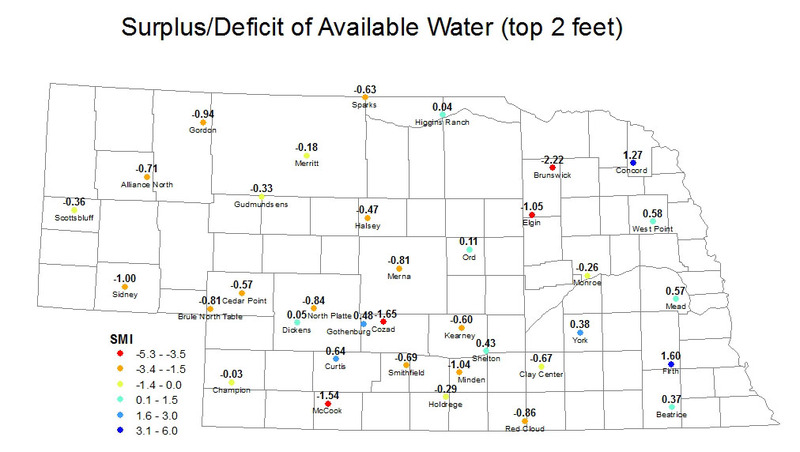 However, if that doesn't pan out, most areas can expect their deficits to go up, or in the case of some eastern Nebraska sites, to go into deficit for the first time this season.